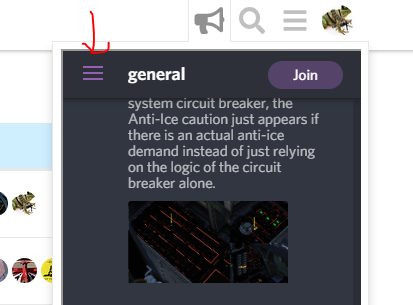 Once logged in to the forums, you can use the ‘bull horn loudspeaker’ icon at the top the page to show the #general chat channel in a live view. After some discussions amongst the Mudspike membership and staff we have decided to give Discord another go. There are a number of positive benefits that, we feel, can make the community into a more efficient collaboration space while encouraging growth in the core of the community. It may not work out in the end but we feel the need to try and approach new ideas even when they may not have worked out in the past. Some of this comes from discussion in the forums with community members, some comes from the dissolution of the official Teamspeak service that we offered, and some comes the realization that the forums were not the best place for some of the discussions that are happening. To that end we want to establish Discord as the location where people can casually chat and discuss what is important to them in the moment and also allow organic organization of their multiplayer gaming. This Discord server is intended to capture the Mudspike community conversations and activities that sometimes do not fit the traditional model of ‘the forums’. We see the Mudspike website as a place for articles, the Mudspike forums as a place for information collection, AARs, and long-term, slow burn discussions, and the Mudspike Discord ‘channel’ as a place for the rapid-fire chat, casual community engagement and multiplayer activities. We hope that this model fits with the perceptions of the community but if you have suggestions, concerns, or recommendations please let us know in the Meta Forum or via PM in the forums. To that end we would like to encourage any member of the community that feels that they would be able to achieve that balance and wishes to help us out in keeping the Mudspike forums and Discord a positive place for community conversation and collaboration to contact us via Forum PM (@staff). As noted above, if you have questions, concerns or suggestions, please let us know. Mudspike is not a commercial enterprise but a community driven site that wants to give an online home to its members and as such we want to make sure that we are meeting or exceeding those goals. PS: For members of the FridgesHotPotato Discord channel (the old Mudspike Discord channel), please jump over to the new channel as that one will go away. Chat & Stuff Group - This channel group collects the regular conversation channels for the Mudspike Discord and is unrelated to the categories that we have in the Mudspike Forums. If you feel that there is a channel that would be useful to the community, please let us know and we will add it. General - This channel collects the mental energies of the Mudspike Community - if we can find a bot to harness that positive pool of power, we will rule the world. This is for all of your random thoughts, feels and emos and it is probably not ADHD safe. Forum Group - These channels are intended to pull and collect casual chat related threads and topics from the Mudspike Forums. There is a bot attached to these channels that will alert you to new threads that have been started in the Forums. We are starting with a limited set of voice channels, not for any reason other than to limit complexity and confusion. If you see the need for an additional channel of three (maybe a dedicated game channel) please let the @staff know and we will convene a committee, take copious notes, vote ourselves retro-active pay raises and get it done. We are, none of us, pigeons and it seems like an artificial separation of members into silos but it allows some control to assign permissions. If you chat via the web icon then it’ll ask for a nickname the first time. It does this because it relays the message via a bot so that people don’t have to create a discord account. If you use Discord already, then probably best to hit ‘Join’ if you want to add a msg. Isn’t this likely to fracture the Mudspike group? Paul, an easier way to think of it is TeamSpeak on steroids. In other words, chat and voice coms combined, but with a certain amount of persistence not available in TS, and not nearly as organized or persistent as a proper forum. At least that’s that way I wrapped my little brain around Discord. Regardless, it also facilitates multiplayer a bit better in that its chat functions can more richly distribute briefing material. I think that those folks into multi and enjoy spontaneous chat will lean toward Discord, and those with less responsive but more persistent sharing of information needs will be more comfortable with a forum. It’s a valid concern @PaulRix and something we have to look out for. One thing I do think is that, in some ways, the fracture has already happened, in that people that want to just chat and MP are already on Discord doing that; they just aren’t being given the option to congregate in a Mudspike group. People tend to belong to lots of groups on Discord (called ‘Servers’ on that side) and Mudspike sort of tried it originally but only in a half-hearted way. We felt it was worth another go with some better integration between the two bits. Plus, like @chipwich said, it is a useful way for people to multiplayer and voice chat as well. If you ever want to say something that needs a reply, or is a topic that needs to stick around longer than 3 minutes, then the forum is still the way to go. Thanks for clarifying guys. Sounds like there is little for me to worry about then. I guess I look at it a little differently. Discord seems to be a nice tool for casual chat, meeting up and getting a multiplayer session going. Something that the forums are not great at. I see the forums as a good place for information storage and discussion - the long burn mentioned above. It is a way to maybe redirect some of the chaotic energy that can take place in some of the threads. For example: Discussing F-18C weapon procedures or how the RIO position works in the Tomcat is something that I hope that the forums can retain, as it makes it easier for people to scroll back and get the good bits. But meeting up for a multiplayer session or having an over-voice tutorial group on the RIO position is not something that the forums do well. Teamspeak covered one part of that but it did not give a good home to the casual chatter that can take place in the forums that some might find distracting. In my view, Discord is a pretty good middle ground. With regard to multiplayer, I do not see our Discord service as competing with any other group or what-have-you. It is a tool to extend the conversation from the forums and, yes, it provides a decent enough VOIP service with a nicely integrated overlay. Heck, I would encourage any group doing multiplayer missions or what-have-you to post in the announcement channel - as long as the session is open to the community ‘where’ you technically implement the mission is secondary to the purpose of tools we are providing. The Mudspike Discord may never host a multiplayer session but it is available to serve that adhoc community. Out of the park sir. Outstanding. I need to learn how to use Discord but in principle this sounds great - I’m notoriously bad at being able to reliably show up at MP stuff so having a place where we can ‘check who happens to be in’ would be wonderful. Discord reminds me a lot of the IRC chatrooms I used to hang around in back when the world was young and there wasn’t a word for trolling yet. It’s just easier to use, easier to setup and has seamless voice comms integrated. I like discord for the gaming Multiplayer stuff but I really doubt it will have any effect on the nice community we have on the forums. Its more like an instant messaging service and a way to speak real voices to the ones you want to speak to. @discobot is not a kind god, he gives about 20 seconds before the post is, um, posted to Discord. It’s to create a sense of drama. (I’ll look at lengthening that time a bit). I wasnt moaning about it I just thought it’s was interesting that now everyone can see I wrote mig 33 and have the spelling and grammar ability of an 8yr old. Damn robots! @fearlessfrog Is the Mudspike server only viewable in the sidebar box thingie? Doesn’t seem to show with my list of other Discord servers. Hey Guod, were you attempting to get to it via invite or Discord search? Clicked the megaphone then hit the join button. Keyed in my name when prompted for “what should we call you around here?”. Shows that I joined the server in the welcome channel. But no nifty Mudspike icon with my other Discord servers. I think at that point Discord is either asking for you to create an account or to sign in with an existing one. If you sign in then it’ll show with your others, otherwise it will happily create another new separate account. Discord is weird.